Nevermore! Caw Caw Caw! Nevermore! Do you hear that? It’s just like the call of a crow only...creepier. Much, much creepier. But you know where that scary sound is coming from, don’t you? You also know just what everyone loves on Halloween night: a really bad omen and a spooky skeletal specter made extra popular by Edgar Allan Poe. 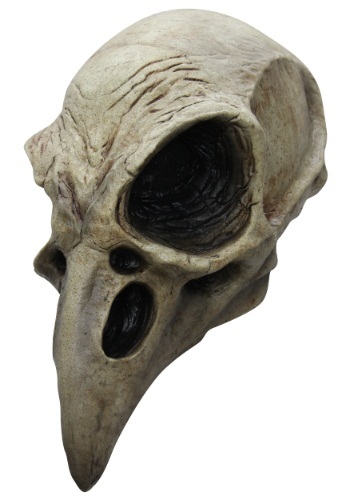 Darken your friends’ eve by sitting on a perch on the party’s front porch in this creepy Crow Skull Mask; it’s bound to be the perfect place to watch out for fresh victims. No guest will know what’s coming to them until you swoop in for the kill or scare, whatever you want to call it. Ghosts are for the birds; pair this particularly petrifying mask with one of our simple robes for a truly frightful costume you can caw on year after year, something your creeped out friends might not appreciate. A different costume every year? Nevermore.